BrightSync provides the capability to synchronize specific BrightDoor Central information (contacts, email, tour appointments) with your company’s Microsoft Exchange 2003/2007/2010/2013 server. This allows you to retrieve and submit information from Exchange-Enabled Desktop Applications, such as Microsoft Outlook (PC) and Entourage (Mac), via a web browser (Microsoft Web Outlook) as well as mobile devices that leverage Microsoft ActiveSync services (iPhone, Blackberry). This capability is flexible, allowing you to configure the specific criteria in which you sync BrightDoor Central information. Note – To avoid server congestion, please allow 15 minutes for each update to complete when using the BrightSync feature. First, contact your IT administrator to confirm that there is an SSL Certificate associated with the Exchange Server and obtain the URL (web address) of the Exchange Server. Once you have your Exchange URL, you will need to configure your “My Profile” settings so BrightDoor Central can connect with your personal Exchange mailbox. Click on the My Profile link in the upper right corner of your home page. Scroll down the page until you see the BrightSync section. Enter your Exchange Username & Password. If you have a different mailbox name or your company is using an Exchange 2003 server (check with your in-house IT administrator), you will need to complete the Exchange Mailbox Name field. Under Synchronize contacts having a status of select the type of contacts you would like to allow BrightSync access to for syncing. You can select multiple statuses by holding down the shift or control key (Apple key for Macs) on your keyboard. Under Apply these synchronization settings to – your options are to apply the BrightSync settings to future contact assignments only or reset the system to sync all currently assigned contacts. 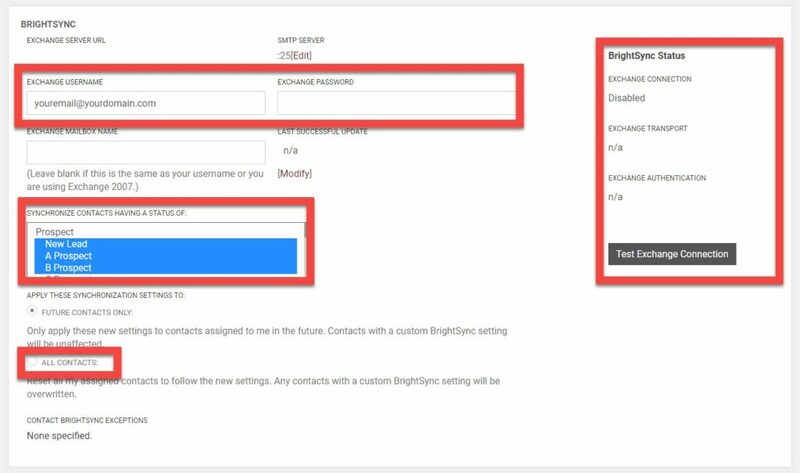 The All Contacts option will remove any existing BrightSync settings for your assigned contacts and make them conform to your new sync settings. To test your settings and confirm that you are communicating with your Exchange server, click the Test Exchange Connection link in the callout box on the right. After the test, a successful connection will result in the message “Connection Test SUCCESSFUL!” If you receive a message such as “Connection Test FAILED! The reason: Failed to login to OWA. Be sure your domain and password are correct.” – Please ensure your Exchange account settings are correct and try to test again. If you continue to have difficulties, please see your IT administrator. Once everything is set, press the Save button at the bottom left of the profile page. To streamline the sync process and relieve potential network congestion, we have designed the BrightSync service to allow the user to specifically target which contacts to sync with based on their contact status (for past and future assigned contacts). However, even if the contact falls into a status configured for BrightSync, you will still need to manually select to sync contact address information and tours for the contact (remember emails will be synced regardless of this extra step). This acts as a fail safe to protect you from auto-syncing a large number of assigned contacts that fall into a BrightSync contact status category (through some bulk assignment method or other reassignment of contacts). This also reduces the amount of data synced between BrightDoor Central and your Exchange server, limiting the chance of slowing down your network and clogging your Outlook or mobile device with non-essential contacts and appointments.